Custom SMS is a feature through which you can send messages to many people at one time by changing some fields such as, name of receiver, mobile number or other details. The content other than these fields will remain the same for all recipients. 2. 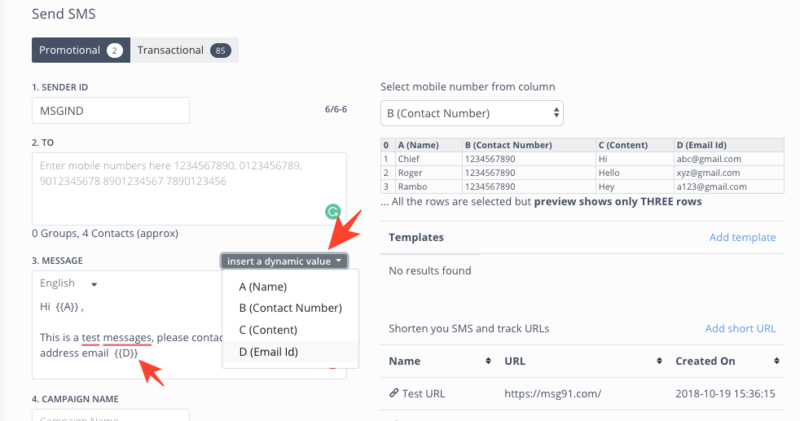 Select "Send SMS" on the panel, and click in the mobile number field to import the sheet created by using the upload file option which appears at the right-hand side of the screen. 4. Select the column in which the mobile numbers are present. 6. Set the name of the campaign, and Click on Preview and Send. 7. Once you are sure by checking the preview you can send the SMS by pressing the Start SMS process button. Booyah..!! your message is sent.